It is with heartfelt sadness that we announce the passing of Linda, at the age of 75, surrounded by her family. She will be greatly missed by her husband Waverly, of 55 years, her children Curtis (Dianne), Melanie (Jon), Shauna (Jeff) and Todd (special thanks to Jean H, Michelle R). She leaves her 5 grandchildren: Megan, Melissa, Derek, Rory and Kelsey. Linda is survived by her sisters: Bobbi (Roy) and Susan as well as Darlene (Morley), Stuart (Denise), Gordon (Dora). Linda will be greatly missed by her nephews and nieces: Rusty (predeceased), Rhonda, Warren, Susie, Dustin, Stacey, Evan, Kristin and Brennan. She was predeceased by her parents Frank and Ella Whiting as well as a very close family friend, Dale Pannebaker. Linda was born in Winnipeg in the midst of WWII. She was the oldest of 3 girls who were raised in Elmwood. She met Waverly in 1961 then married in 1963. They lived in Winnipeg where Curtis, Melanie and Shauna were born and then moved to Roland on 5th Street in 1970. Furthermore, the family grew to be 6 with Todd and then moving to 1st Street in 1974. Gardening was her passion! She was involved in the community volunteering many hours with organizations such as: 4-H, CGIT, Cubs/Scouts, church tea/bake sales, Roland elementary school lunch program, she was a member of Roland Curling Club, she provided meals for hockey tournaments, bonspiels and the Roland Antique Tractor Club. 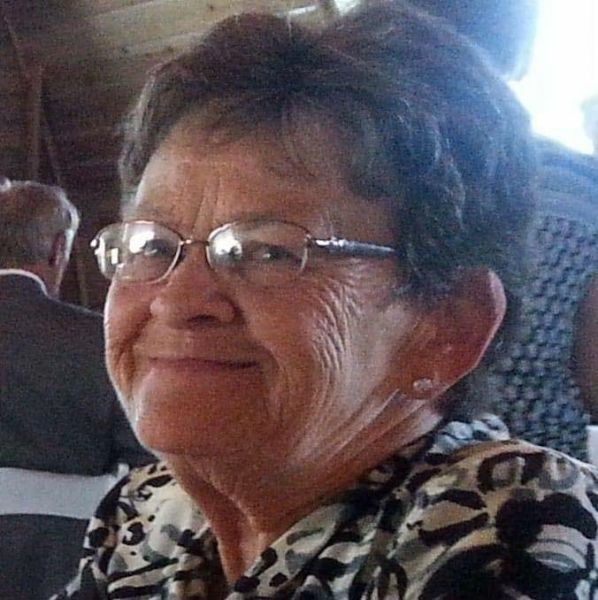 Linda worked at many restaurants throughout her working years including being employed as a carhop at A&W, Linda's Kitchen, Roland Golf Club, Roland Store and then retiring after 25 yrs in the Homecare field. Linda will always be remembered for her cute giggles, her selfless gestures, being a gentle soul, always giving and was ready to help. She was a good listener, a nurturer, her love of dance, her amazing Chinese food, her interest/passion in caring for senior citizens, cooking/baking. We would like to thank all of the staff at Carman Memorial Hospital and Boundary Trails Health Center for all their help, love and support for Linda's care in her untimely illness. To all family, friends and beyond: your thoughts, prayers and visits will always be remembered and deeply appreciated by the family. Celebration of Life will be held at 11:00 am at Roland United Church with Shirley McLaren officiating. Interment will take place at a later date in Fairview Cemetery, Roland. We are so sorry for your loss. I met your mom a couple times. She was a super nice lady, very witty. Thinking of you Wave in your time of sorrow. Heartfelt Sympathy to you all. Your mom was a special and very kind lady. My sincere condolences on your loss. I pray that memories of happier times will see you through your time of grief! "God gave us memory so we might enjoy roses in winter." Sincere condolences Wave to your and all your family. We go back a long way with good memories. Linda will truly be missed. Condolences to Curtis, Diane and family. Thinking of you all she will be remembered as an awesome coworker friend mother and grandmother. Thinking of all of you big hugs. My heart feels for your loss. Linda was such a loving, gentle woman. I picture her at home teaching her family to dance. May Happy Memories comfort you in your time of loss.